When it comes to children's television, there are always going to be the favorites and the runners up. Around here, Caillou is one name that is mentioned time and time again, as both Big Sister E and Little Sister B are enthralled with the adventures and tales that this preschooler goes through on a daily basis. 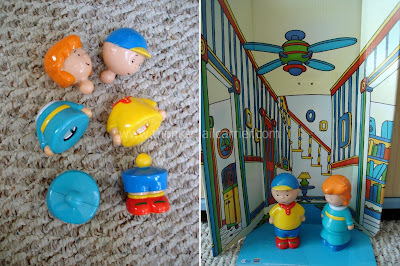 Whether he's having fun at home being a typical 4-year-old with his toddler sister, Rosie, expressing his imagination at Play School with his friends, or helping out Mom and Dad around town, we have enjoyed Caillou on PBS KIDS or Sprout for quite some time now. Considering how much time he spends on our television screen, I was pretty sure that the girls would be thrilled to have Caillou around to play with in person... and when the Caillou Doll and Caillou Learning Train arrived, that was proven completely correct. 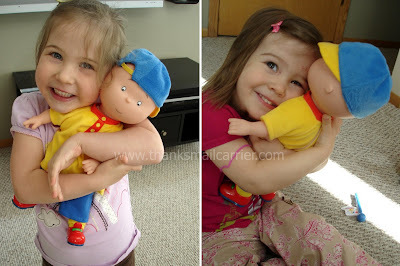 Retailing for $29.99, the Caillou Classic 14.5 inch Doll (ages 3-5) is the perfect way to allow kids to carry, cuddle and enjoy playing with their favorite character. His vinyl head, arms and feet are plenty durable that they will last and can be wiped off at any time for easy cleaning. 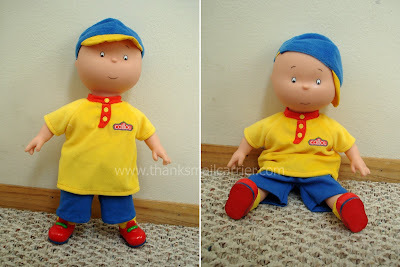 Caillou's body, on the other hand, is soft and cuddly, perfect for snuggling and hugs to his traditional outfit of yellow shirt and blue shorts. Capturing the attention and hearts of both girls, Big Sister E and Little Sister B have had Caillou take all kinds of adventures around here and, at 14.5" tall, he is a great size for just about anything that they dream up for him to do. 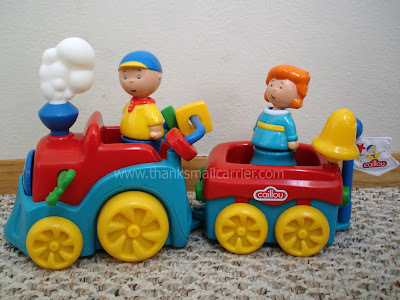 When they aren't playing with the Caillou Doll, our second toy, the Caillou Learning Train, has also provided an endless amount of entertainment from the day that it chugged in. Designed for ages 12 months and older, the Caillou Learning Train retails for $24.99 and has proven to be just as high quality as the Doll. Featuring a separate engine and passenger car as well as Caillou and Rosie figures, this train is eye-catching with its bright colors and long list of fun additions. From the wind-up key to make the train move on its own (works best on a hard surface) to the squeaky steam on the front to the crinkly flag to the bell that rings to the bead shapes that move... it is a sensory experience every time this toy comes off of the shelf! 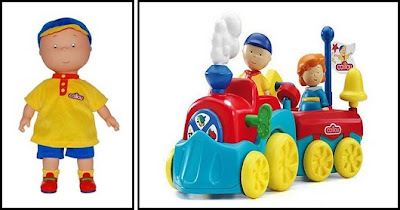 When Caillou and Rosie aren't moving up and down while riding on their train, they easily pop on and off and come apart into three pieces each. Big Sister E has gotten a big kick out of putting Caillou's head on Rosie's body while Little Sister B likes to simply take both characters and move them around the house during pretend play. In fact, we removed the background of the box that the Caillou Doll arrived in and it serves as the perfect backdrop for all kinds of stories and mischief that the kids can get into. Showing children that growing up can be fun even while being overwhelming at times, Caillou is one character that is a good role model for young viewers everywhere. Now, with the ability to bring the cartoon to life with these high quality toys (which contain no small, choking hazard-size pieces), they have just made it even more easy for kids to enjoy. If there is a Caillou fan in your life, these would make great gifts for just about any occasion. For more information or to make a purchase, Caillou toys can be found at 272 participating Toys R Us stores (visit the store locator to find the one nearest you) and online at sites such as www.toysrus.com, www.fao.com, www.kohls.com, and www.tystoybox.com. We're not the only ones having fun with Caillou! For another great review on these products, visit Shop with Me Mama!